I had a Jasmine costume for Halloween when I was a kid. She was awesome! See my reply to KBLoveDisney. Also, I don't like pandering or posing. The only reason Swann could do what she did in Pirates - wield a sword and know how to sail a ship - was entirely doe to pandering. She was a governor's daughter for crying out loud. When did she learn to use a sword? How was that believable? It wasn't. It was PC, and it damn near ruined the first Pirates film IMO. I couldn't stand her. Give me believable strong female Disney characters like Belle any day. And let the men rescue them if it serves the story! What's wrong with that? So the woman using the sword is what made that not believable? You were cool with the pirates who stole gold from a cursed chest and became living dead, the random canons on lines to allow escapes, sailing a boat that was completely sunk, and holding an upside down boat underwater,, but the governors daughter learning how to wield a sword ruined the believably of it? Funny thing is, I really liked that movie, and I still can't remember where she used the sword at some sort of elite level. I would guess towards the end, but I don't remember. Maybe I'm just not a great movie fan (as I fully admit, I don't analyze the angle of shots or the setup of the minor plots, I just look to be entertained). I remember it being brought up about Rey, and I remember thinking "Huh, guess that is kind of true." I didn't notice it in the least when I watched it, so I doubt I would notice it elsewhere. Anyways, I for one am not excited for this movie, in large part because I do not think anyone can come close to Williams, and he is the main character I care about in the film. Smith could prove me wrong, but I'm definitely going to have a bias going into this one (which I think in part was why I hated the Beauty and the Beast remake as well). Gawd, don't get me started on the Beauty and the Beast remake. I tried to like it, I really did try. So the woman using the sword is what made that not believable? You were cool with the pirates who stole gold from a cursed chest and became living dead, the random canons on lines to allow escapes, sailing a boat that was completely sunk, and holding an upside down boat underwater,, but the governors daughter learning how to wield a sword ruined the believably of it? Yes we all know that pirate curses that turn you into skeletons in the light of the moon are not real. But in that world it is real so you can buy into it. But when a character can do things for no explained reasons, it can ruin the believability. For me it doesn't matter if it's a male, female, whatever, There should be some explanation. So I get why @Magenta Panther said what he said. So I just don't find that reasoning to work. Everything should be believable in the world that it was established in. But maybe thats just me. But did the boat scenes make you equally angry? First, none of it makes me angry, I'm not that guy. Second, it really didn't bother me because, again, things like Davey Jones locker and the Dutchman were already established. Now if you asked did you like it, I would say it's not the greatest and they could have come up with something better. If Steve Rogers woke up one morning and was all of a sudden Captain America, that would be a weak arc. And you shouldn't just accept it because, well there's a guy with a red skull head that has super energy weapons. And you know, it would have been easy to explain Swann's prowess with swords and such. Early in the film it's established that she's fascinated by pirates, or at least was in her youth. Perhaps the script should have included a mention by her father that he indulged his daughter's fascination by letting her take fencing lessons and shipcraft and so on. Then Swann's swordfighting abilities etc. would have made some sense. But as it was, we got no explanation for her skills, so it came across (at least to me) as pandering. Which I think is insulting to women, if anything. Anyway, glad we seem to agree about narrative logic within a fictional universe. Everything else in the first Pirates film was so entertaining. I hated that the Swann character nearly ruined my enjoyment. I still find her hard to overlook even now. 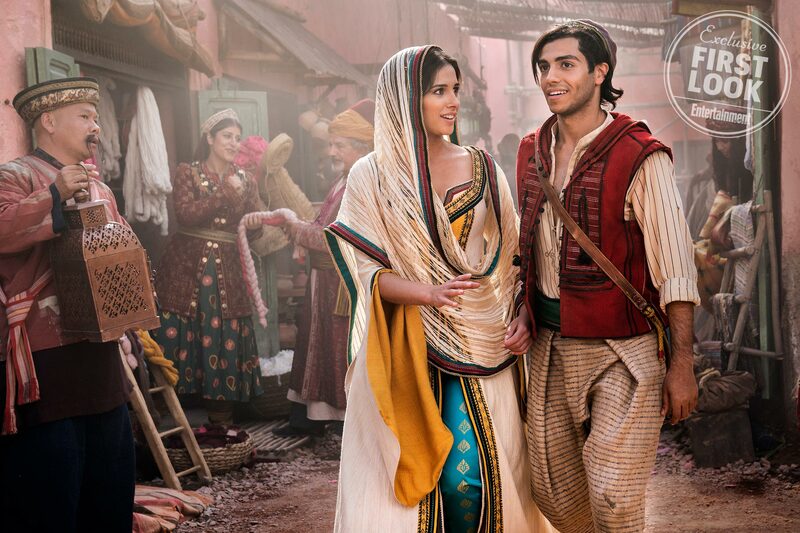 ANYWAY, I admit that I am prejudging the Aladdin remake based on a magazine cover, which is a tad ridiculous, but good grief, couldn't the lady crack a smile? Why should she need to smile? If the photographer wanted her smiling, they would have asked her to. I hope you don’t ask women in your daily life to smile. "(and yes, I’m gonna be BLUE! This is how the Genie is in Human / Disguise Form. My character will be CGI most of the movie.)" Which means 5 minutes total of him in blue form (When Aladdin first meets him and at the very end of the film when Aladdin frees him from the lamp for good) and the majority of the movie he will be like he looks here, which is Will Smith in a very bad cosplay outfit. you gotta read between the lines. They hired Will Smith for a reason, so they could show Will Smith instead of having him be in a mocap suit and cgi the character the whole time ala Josh Brolin as Thanos. You know I watched on You Tube an old episode of SISKEL & EBERT about the animated ALADDIN movie when it first came out and man did it really made me realize something about the greatness of that film I never realized before but my brain did subconsciously. 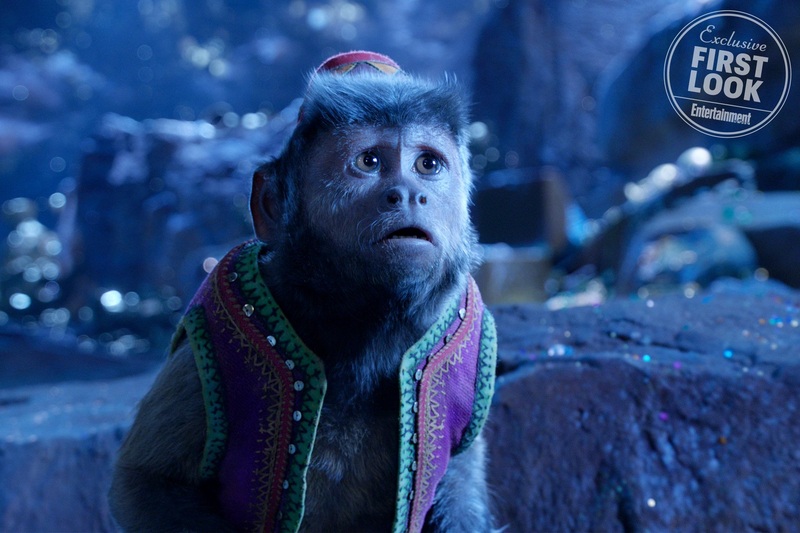 They mention how Aladdin is really not a character or even much of a character and that the real star of the film was GENIE. That Robin Williams performance was soo great and fun and extrodinary that he had to have some script input during the writing phase for them to pull off some of the animated jokes he does in the film. That it is really his film and once he comes into the story the movie really begins. and they were right. and after hearing of Smith's casting and now seeing this picture and realizing he is going to look like this the majority of the film it makes me realize there is no way Smith can pull off one tenth of the performance Williams did with just his voice alone. Remember how Williams' GENIE never had a "human desiguse form" for the whole film? sure during the prince ali song he changed his pigmentation to appear more human during the parade and when he turns into the boy, the old man and the woman during the song but he is still the GENIE for the majority of the film. the only disguise he really does is when he shrinks size so he can hide under ALADDIN'S hat. we are going to just get Will Smith being Will Smith for 90 minutes. Unless you count the reveal that Genie was the vendor who sang Arabian Nights (revealed in 40 Thieves, but planned for the original). I think I’m going to withhold opinion on this one, since the only two actors that I have seen before are Nasim Pedrad (Jasmine’s friend) and Will Smith. Elizabeth Never Used A Sword In CotBP (this is like a very little dialogue version of the final scene, but she only used that curtain rod to fight, and let’s be honest, Will was doing most of the legwork). After that, why shouldn’t she have learned to fight properly? She was kidnapped by (cursed) pirates and her fiancé was a blacksmith. In regards to that magazine cover... it’s just a bad cover, and again, I’m withholding judgment until I see the movie. You didn’t know? She was a governor’s daughter and therefore she had no business learning how to sword fight. Also, she’s a woman; if a woman is in distress, we are to wait for a man to rescue us. Forget trying to help and save ourselves in some way in the meantime. We need logical reasons to be independent. Now that my sarcasm is over, shoutout to the women who make an attempt to protect themselves when I’m danger, and NOT wait for a man to hopefully come. See, this is why the whole PC/SJW stuff becomes a problem. No one is saying woman can't do any of that. Just give a proper explanation, give the character development they deserve. Not just I am woman hear me roar! But of course when this gets brought up, it immediately devolves into, you just have a problem with woman. Like I said earlier, I want ALL characters properly developed and I have the same criticism if they're male. See, this is why the whole “PC/SJW” stuff is often taken out of context. When was there a lack of explanation in the plot? Who said people here have a problem with women?